Modify your landscape. Keep your home dry. Drainage problems often arise from the physical profile of your property. Sometimes, the land channels stormwater toward your home or holds it against the foundation. Land can also hold stormwater in your yard or other areas where it doesn’t belong. When these conditions exist – and when you want a permanent, long-term solution – restructuring the land may be the best option. A comprehensive analysis of your home and surrounding landscape shows us whether – and how – the land transports water to problem areas. Sometimes, a large area requires restructuring. Other situations call for minor changes. We apply one or more land restructuring techniques as part of an overall custom drainage solution. From backfill restoration to grading, swales, and hardscape products, our team applies corrections designed to improve or eliminate your drainage problem. Land restructuring ranges from simple to significant and might include backfill restoration, general grading, retaining walls, or other modifications. Sod, seed, or other landscape finishes often complete the solution. The best part? Repairing the grade provides a zero-maintenance drainage correction with no mechanical parts to service. Over time, the backfill around your home settles. When this happens, stormwater can seep into your home. We restructure and restore the backfill to prevent water entry. The best way to achieve a zero-maintenance, non-mechanical drainage solution! Proper grading keeps stormwater away from your problem areas. Following grade corrections, landscape and hardscape options provide a clean finish. 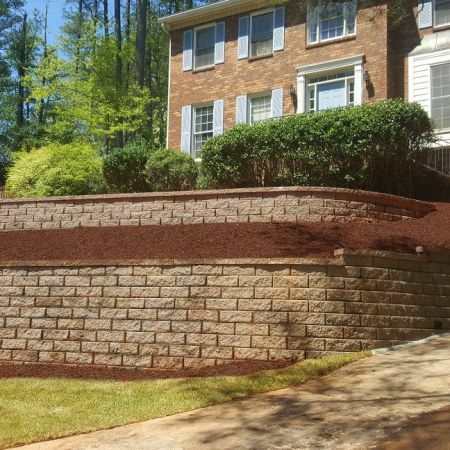 We may save your existing grass, lay new sod, construct a retaining wall, or build steps within the landscape.